Restrict traffic on the network by configuring standard IPv4 ACLs. In Part 1, you will configure and apply access list 10 to restrict access to the Pink LAN. Step 1: Outline what you wish to accomplish with access list 10. 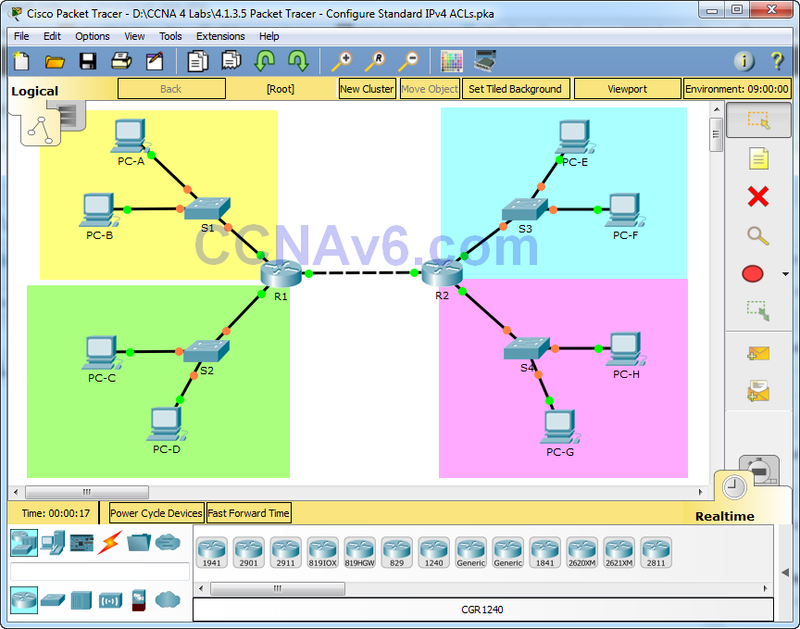 Access list 10 should be configured on the correct router, and applied to the correct interface and in the right direction. Step 2: Create, apply, and test access-list 10.
a. A ping from PC-A to a host in the Pink LAN should be successful, but a ping from PC-B should be denied. b. A ping from PC-C to a host in the Pink LAN should be successful, but a ping from PC-D should be denied. c. Pings from hosts in the Blue LAN to hosts in the Pink LAN should be successful. What message is sent back to the PCs when a ping is denied due to an ACL? Which IP addresses on the Yellow LAN are permitted to ping hosts on the Pink LAN? Access list 10 permits pings to the Pink LAN from hosts 192.168.1.1 to 192.168.1.127 on the Yellow LAN. In Part 2, you will configure and apply access list 20 to restrict access to the Blue LAN. Step 1: Outline what you wish to accomplish with access list 20. 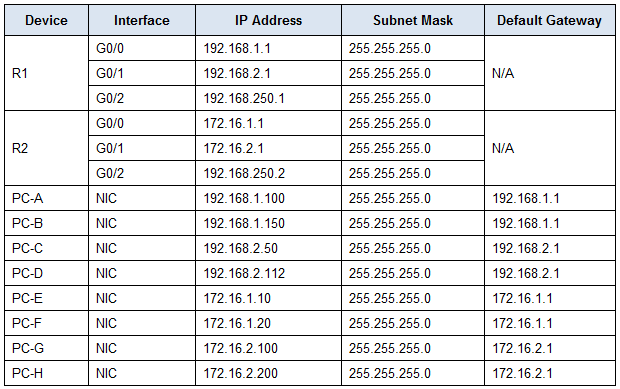 Access list 20 should be configured on the correct router, and applied to the correct interface and in the right direction. Step 2: Create, apply, and test access-list 20.
a. Only PC-A on the Yellow LAN can successfully ping the Blue LAN. b. Pings from hosts in the Yellow LAN to the Blue LAN should fail. c. Pings from hosts in the Green and Pink LANs to the Blue LAN should be successful. Step 3: Insert an ACE into access-list 20. You need to make a change to access list 20. Insert an access control entry into access list 20 to permit PC-A to reach the Blue LAN. Insert the ACE prior to the other access list 20 permit and deny access control entries. How do you insert or remove an ACE into a specific line of an ACL? To insert or remove an ACE on a specific line enter the ACL using the ip access-list keywords and arguments as if the numbered ACL was a named ACL. What line did you enter the ACE on? Answers may vary but inserting the ACE on lines 1 through 9 would all work. In Part 3, you will configure and apply a named standard IPv4 ACL to restrict remote access to router R1. Step 1: Outline what you wish to accomplish with named standard ACL. Step 2: Test access-list ADMIN_VTY. a. An SSH connection from host PC-C to R1 should be successful. b. SSH connections from all other hosts should fail. This lab features two standard ACLs to restrict traffic to the Pink and Blue LANs. Could you create 2 more standard ACLs to restrict traffic to the Yellow and Green ACLs and which router would those ACLs need to be created on? Yes, you could create a standard ACL for G0/0 and G0/1 on router R1 to restrict access to the Yellow and Green LANs.